If you love strawberries, you’ll love this old fashioned baked strawberry pie. With only a few simple ingredients, this fresh strawberry pie recipe highlights the juicy sweetness of the strawberries. Using prepared pie crusts, this easy pie recipe is ready for the oven in just minutes. Not only are you making a great tasting dessert for your family, strawberries are good for you. To find out more about the nutritional benefits of strawberries, click here. 1. Preheat oven to 425 degrees F. Place foil on lowest oven rack to catch drips. 2. Clean and hull strawberries. Dry strawberries with paper towels and set aside. 3. Fit 1 pie crust into pie pan. 4. In a small bowl, mix sugar, flour and orange peel. 5. Put half of the strawberries into pastry lined pie plate. Sprinkle with half of the sugar mixture. Put remaining strawberries in pie crust and top with remaining sugar mixture. Dot with small pieces of butter. Cover with top crust, seal and flute edges. 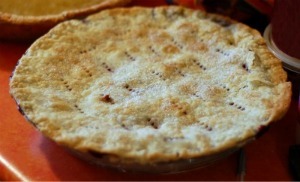 Wrap edges of pie crust with 2 to 3-inch strip of aluminum foil to prevent excessive browning. Cut small slits in top crust. Sprinkle top with additional sugar if desired. 6. Bake for 40 to 50 minutes, (removing foil during the last 15 minutes of baking), until crust is browned and juice begins to bubble through slits in crust. Remove from oven and cool.